March 17th thru 23rd, 2019 is National Poison Prevention Week. The American Association of Poison Control Centers (AAPCC) supports the nation’s 55 poison centers in their efforts to prevent and treat poison exposures. 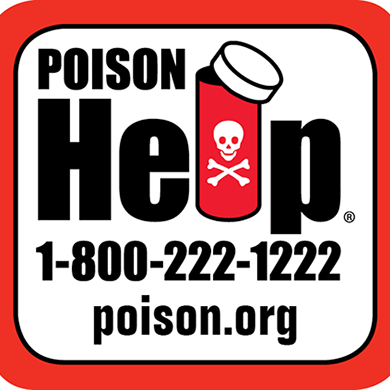 Poison centers offer free, confidential medical advice 24 hours a day, seven days a week through the Poison Help Line at 1-800-222-1222. Each year, between 2 to 4 million actual poisonings occur in the United States. Approximately 90% of poisonings occur in the home. Poisoning can occur at any time of the day or night, but peak hours are generally between 4PM and 11PM. On average, poison control centers handle one poison exposure every 8 seconds. Most poisoning exposures are unintentional and the majority occurs in children under the age of six. Keep Children where you can see them at all times. Never leave young children alone, not even to answer the door/telephone. Keep your purse up high out of the reach of children if it contains medication/cosmetics. Safety Latches on drawers/cabinets, child resistant caps on bottles are good practices, but they aren’t 100% “child proof”. Refer back to the 1st tip for a curious and determined child will find a way to get into something. The child’s age & weight. The information on the container, or a description of the substance of what the child came in contact with. Note: Obtaining the information cited above applies to children, adults and pets in any poison medical emergency. If you think a child in your care has been poisoned, don’t panic! Do not wait for the child to look or feel sick. Poison centers take all kinds of calls, even calls that aren’t emergencies. You can obtain additional poison prevention and control safety tips for children, teens, adults and pets by logging onto poison control.